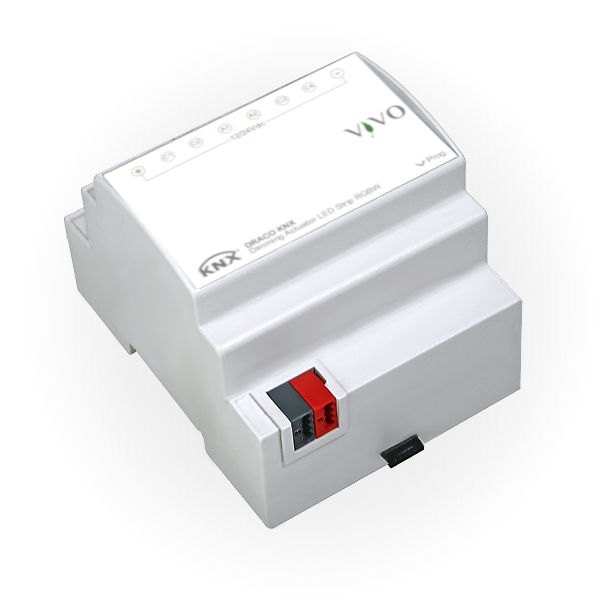 The Vivo DRACO KNX dimming actuator is an KNX device for switching and dimming of 4 groups of LED lights/stripes indipendently or sincronized in a RGB/RGBW stripe (control on common anode). The device is equipped with an integrated bus communication module . To operate, the device receives a telegram from the bus, sent by a KNX device (such as a button, a sensor or another switching or control device), which controls dimming of the light intensity emitted by the lamp of the connected lighting device. The device also allows manual switching/ dimming of an output channel with the buttons on the front of the device. The device is powered by the KNX bus line with 30 Vdc SELV voltage and works with an external power supply which can be chosen according to the power to be applied.